The name Papiermark ( pronunciation (help·info); English: "paper mark", officially just Mark, sign: ℳ) is applied to the German currency from 4 August 1914 when the link between the Goldmark and gold was abandoned, due to the outbreak of World War I. 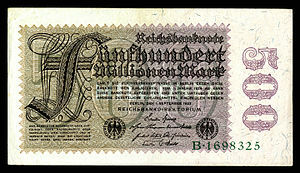 In particular, the name is used for the banknotes issued during the hyperinflation in Germany of 1922 and especially 1923. From 1914, the value of the Mark fell. The rate of inflation rose following the end of World War I and reached its highest point in October 1923. The currency was stabilized in November 1923 after the announcement of the creation of the Rentenmark, although the Rentenmark did not come into circulation until 1924. When it did, it replaced the Papiermark at the rate of 1 trillion (1012) Papiermark = 1 Rentenmark. Later in 1924, the Rentenmark was replaced by the Reichsmark. In addition to the issues of the government, emergency issues of both tokens and paper money, known as Kriegsgeld (war money) and Notgeld (emergency money), were produced by local authorities. The Papiermark was also used in the Free City of Danzig until replaced by the Danzig Gulden in late 1923. Several coins and emergency issues in papiermark were issued by the free city. During the war, cheaper metals were introduced for coins, including aluminium, zinc and iron, although silver ½ Mark pieces continued in production until 1919. Aluminium 1 Pfennig were produced until 1918 and the 2 Pfennig until 1916. Whilst iron 5 Pfennig, both iron and zinc 10 Pfennig and aluminium 50 Pfennig coins were issued until 1922. Aluminium 3 Mark were issued in 1922 and 1923, and aluminium 200 and 500 Mark were issued in 1923. The quality of many of these coins varied from decent to poor. During this period, many provinces and cities also had their own corresponding coin and note issues, referred to as Notgeld currency. This came about often due to a shortage of exchangeable tender in one region or another during the war and hyperinflation periods. Some of the most memorable of these to be issued during this period came from Westfalen and featured the highest face value denominations on a coin ever, eventually reaching 50,000,000 Mark. In 1914, the State Loan Office began issuing paper money known as Darlehnskassenscheine (loan fund notes). These circulated alongside the issues of the Reichsbank. Most were 1- and 2-Mark notes but there were also 5-, 20-, 50- and 100-Mark notes. The victor nations in World War I decided to assess Germany for their costs of conducting the war against Germany. With no means of paying in gold or currency backed by reserves, Germany ran the presses, causing the value of the Mark to collapse. [disputed – discuss] Between 1914 and the end of 1923 the German papiermark’s rate of exchange against the U.S. dollar plummeted from 4.2 mark/dollar to 4.2 trillion mark/dollar. The price of one gold mark (0.35842g gold weight) in German paper currency at the end of 1918 was two paper mark, but by the end of 1919 a gold mark cost 10 paper mark. This inflation worsened between 1920 and 1922, and the cost of a gold mark (or conversely the devaluation of the paper mark) rose from 15 to 1,282 paper mark. In 1923 the value of the paper mark had its worst decline. By July, the cost of a gold mark had risen to 101,112 paper mark, and in September was already at 13 million. On 30 Nov 1923 it cost 1 trillion paper mark to buy a single gold mark. In October 1923, Germany experienced a 29,500% hyperinflation (roughly 21% interest per day). Historically, this one-month inflation rate has only been exceeded three times: Yugoslavia, 313,000,000% (64.6% per day, January 1994); Zimbabwe, 79.6 billion% (98% per day, November 2008); and Hungary, 41.9 quadrillion% (207% per day, July 1946). On 15 November 1923 the papiermark was replaced by the rentenmark at 4.2 rentenmark/dollar, or 1 trillion papiermark/rentenmark (exchangeable through July 1925). During the hyperinflation, ever higher denominations of banknotes were issued by the Reichsbank and other institutions (notably the Reichsbahn railway company). The Papiermark was produced and circulated in enormously large quantities. Before the war, the highest denomination was 1000-Mark, equivalent to approximately 50 British pounds or 238 US dollars. In early 1922, 10,000-Mark notes were introduced, followed by 100,000- and 1 million-Mark notes in February 1923. July 1923 saw notes up to 50 million-Mark, with 10 milliard (1010)-Mark notes introduced in September. 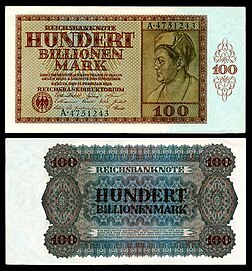 The hyperinflation peaked in October 1923 and banknote denominations rose to 100 trillion (1014)-Mark. At the end of the hyperinflation, these notes were worth approximately £5 sterling or US$24. Jakob Meyer of the Meyer zum Pfeil family. The Danziger Privat Actien-Bank (opened 1856) was the first bank established in Danzig. They issued two series of notes denominated in thalers (1857 and 1862–73) prior to issuing the mark (1875, 1882, 1887). These mark issues are extremely rare. The Ostbank fur Handel and Gewerbe opened 16 March 1857, and by 1911 two additional banks (the Imperial Bank of Germany and the Norddeutsche Credit-Anstalt) were in operation. The German papiermark was issued by Danzig from 1914 to 1923. Five series were issued during World War I by the City Council (1914, 1916, 1918 first and second issue, and 1919). Denominations ranged from 10 pfennig to 20 mark. 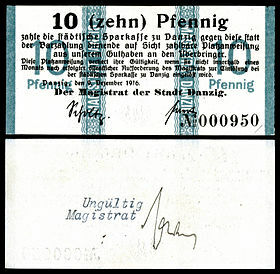 The Free City of Danzig municipal senate issued an additional four post-World War I series of notes (1922, 1923 First issue, 1923 Provisional issue, and 1923 Inflation issue). The 1922 issue (31 October 1922) was denominated in 100, 500, and 1000 mark notes. The denominations for the 1923 issue were 1000 (15 March 1923), and 10000 and 50000 mark notes (20 March 1923). The 1923 provisional issue reused earlier notes with a large red stamp indicating the new (and higher) denominations of 1 million (8 August 1923) and 5 million (15 October 1923) mark. The last series of Danzig mark was the 1923 inflation issue of 1 million (8 August 1923), 10 million (31 August 1923), 100 million (22 September 1923), 500 million (26 September 1923), and 5 billion mark notes (11 October 1923). The Danzig mark was replaced by the Danzig gulden, first issued by the Danzig Central Finance Department on 22 October 1923. In German, Milliarde is 1,000,000,000, or one thousand million, while Billion is 1,000,000,000,000, or one million million. ^ All values are in Reichsbank Mark. ^ Series date printed on the banknote. ^ a b Barisheff 2013, p. 32. ^ a b c d Fischer 2010, p. 85. ^ a b Fischer 2010, p. 91. ^ Widdig 2001, p. 48. ^ Cuhaj 2010, pp. 555–64. ^ Cuhaj 2009, pp. 629–36. ^ Cuhaj 2010, pp. 555–56. ^ Cuhaj 2010, pp. 556. ^ a b c Cuhaj 2010, pp. 557. ^ a b c Cuhaj 2010, pp. 558. ^ Cuhaj 2010, pp. 558-59. ^ Cuhaj 2010, pp. 559. ^ Cuhaj 2010, pp. 560-61. ^ a b Cuhaj 2010, pp. 561-62. ^ a b Cuhaj 2010, pp. 562. ^ Cuhaj 2010, pp. 562-63. ^ a b Cuhaj 2010, pp. 563. ^ Cuhaj 2010, pp. 563-64. ^ Kelly 1920, p. 30. ^ a b Cuhaj 2009, p. 613. ^ Rand McNally 1911, p. 972. ^ Cuhaj 2010, pp. 427–30. ^ a b Cuhaj 2010, pp. 427–28. ^ Cuhaj 2010, pp. 428–30. ^ Cuhaj 2010, pp. 428. ^ Cuhaj 2010, pp. 429. ^ Cuhaj 2010, pp. 429–30. ^ a b Cuhaj 2010, pp. 430. Barisheff, Nick (2013). $10,000 Gold – Why Gold’s Inevitable Rise is the Investor’s Safe Haven. John Wiley & Sons Canada, Ltd. ISBN 978-1-118-44350-7. Cuhaj, George S., ed. (2009). Standard Catalog of World Paper Money Specialized Issues (11 ed.). Krause. ISBN 978-1-4402-0450-0. Cuhaj, George S., ed. (2010). Standard Catalog of World Paper Money General Issues (1368-1960) (13 ed.). Krause. ISBN 978-1-4402-1293-2. Fischer, Wolfgang C., ed. (2010). German Hyperinflation 1922/23: A Law and Eonomics Approach. Josef Eul Verlag GmbH. ISBN 978-3-89936-931-1. Kelly, William J. (1920). "The Situation at Danzig". Journal of the American-Polish Chamber of Commerce and Industry. American-Polish Chamber of Commerce and Industry. 1 (6). Rand McNally (1911). "The Rand-McNally Banker's Director and List of Attorneys". Rand McNally International Bankers Directory. Rand McNally & Company. 70 (1). Widdig, Bernd (2001). Culture and Inflation in Weimar Germany. University of California Press. ISBN 0-520-22290-3.